The Paris UNFCCC Climate Change Conference in December 2015 saw 195 nations meet to agree on keeping temperature rises below 2 degrees Celsius. However without a tool to publicly see who was making climate funding investments global negotiations were difficult. We took the brief on 1st December, exchanging conference calls and sketches on napkins. We had just 3 days to design, build, and launch a website to present the world's funding in an easy to understand format before the end of the conference. We started the design process that evening and wrote the data load scripts in parallel to create a workable database. For the front end, we coded a dynamic display based on positioning elements on axes to represent the amount of funding on a timeline; adding currency, links and other information to each element as well. By Friday 4th December the beta site was launched and demonstrated to members of the host French delegation on Saturday 5th. 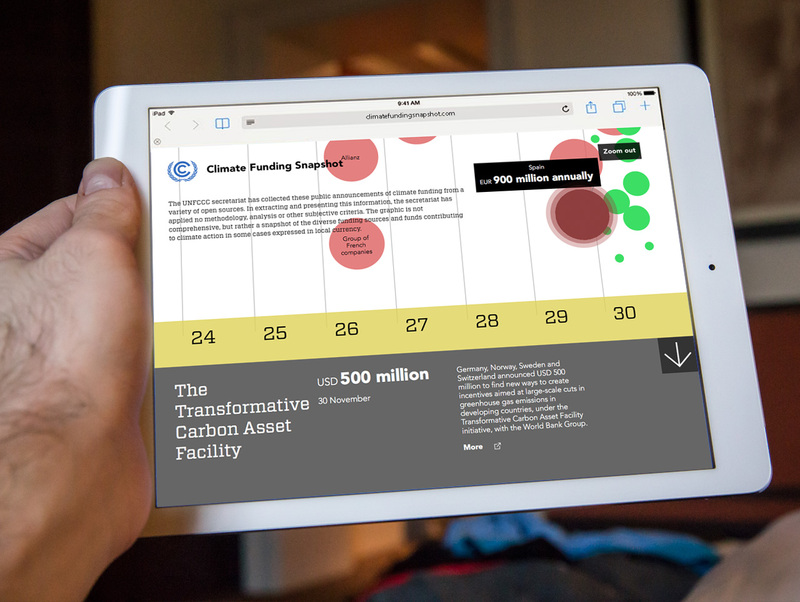 www.climatefundingsnapshot.com was launched and deemed to be hugely instrumental in helping the agreement take place.